When a friend drew my attention to Conan O’Brien’s trip to Haiti following the infamous ‘sh&€hole’ debate which named the island among other countries, I did not see myself writing about the program as an excellent example of how a celebrity gets broadcasting from a distant, foreign place right. Unlike most celebrity ambassadors for large global organizations or celebrities with their own organization and mission to ‘eradicate poverty’, Conan’s independence and authenticity are his biggest assets as he strolls around Port-Au-Prince and talks to Haitians. His self-depreciating brand of humor clearly helps him in connecting with people and he is not afraid to sport the worst French accent I have heard in a long time or fool around with kids in a primary school. His secret to me is that he does not seem to do it for the photo-op or the instagrammable moment when the celebrity kicks the football across the dusty pitch, but he is immersing himself as much as possible within the constraints of a TV program. 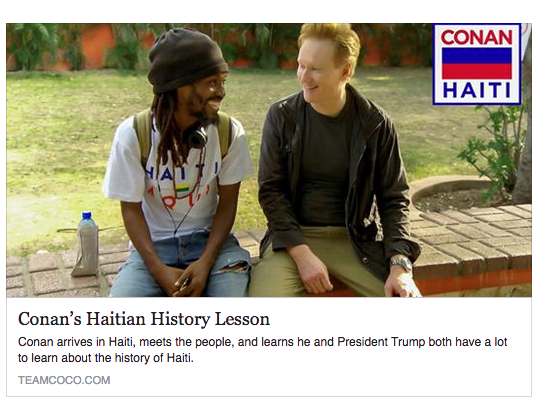 In one of the first episodes he lets Haitians present part of their history and the themes emerge that feature in all episodes: The people of Haiti are proud, resourceful, funny, hard-working people – and Conan meets them as a curious, respectful visitor – not a celebrity tourist who needs to ‘raise awareness’ and funds. Maybe Conan is just a smart man, or he has a great team of researchers or it just worked out by coincidence (most likely it is a mix of all of the above), but he manages to communicate differences with very little exoticism. Port-Au-Prince may not be L.A. – but there are still a lot of aspects that create a common ground, a bound of humanity rather than fostering a notion of a ‘sh?%hole’ country that produces refugees and problems. He is visiting a school, talks to artists, visits a culinary training project as well as a women’s entrepreneurial collective and manages to avoid many of the clichés that these encounters often produce. From a curious girl at the school who wants to be US President one day to the female chef who runs the cooking classes to the women’s market where Haiti-born entrepreneurs with Harvard MBAs returned from the US to build companies, he is hanging out with many great women. UNICEF or UN Women probably could not have done a better job in promoting inclusive development. But that is the whole point: It is not a ‘development’ visit, it is Conan getting on a plane to see for himself what Haiti looks like. This is TV, of course, and making scripted segments look naturally is one of the biggest achievements. But this is not meant to be a documentary or a long-form journalistic piece for the New York Times. It is meant to bring some real Haitian people and positive examples to late-night, mainstream US television. Given how much celebrities usually get wrong when their good intentions lead to cringe-worthy encounters between a Western ‘us’ and a distant ‘them’, Conan’s edutainment series on Haiti stands out as a good example of how you can communicate some of the complexities of development without losing sight of actual people who live real lives in challenging circumstances. “There were a few of the girls who I talked to who were very opinionated and one of them was saying, ‘Americans come here to take from us and they don’t give back,’ and I was assuring her … I am not here to do that,” O’Brien said. His program is an important reminder that celebrities do not have to bring ‘stuff’ to impoverished people, adopt their children or set up an organization themselves because the aid industry is too slow and inefficient in their views. 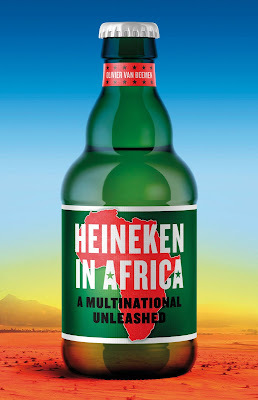 Promoting tourism, cornflakes, art and culture are actually great ways of encouraging people to explore foreign places, meet different people and taste real hot sauce.